The Earth's forests perform a well-known service to the planet, absorbing a great deal of the carbon dioxide pollution emitted into the atmosphere from human activities. But when trees are killed by natural disturbances, such as fire, drought or wind, their decay also releases carbon back into the atmosphere, making it critical to quantify tree mortality in order to understand the role of forests in the global climate system. Tropical old-growth forests may play a large role in this absorption service, yet tree mortality patterns for these forests are not well understood. 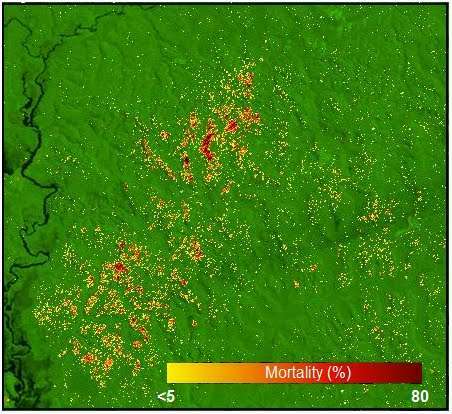 Now scientist Jeffrey Chambers and colleagues at the DOE's Lawrence Berkeley National Laboratory (Berkeley Lab) have devised an analytical method that combines satellite images, simulation modeling and painstaking fieldwork to help researchers detect forest mortality patterns and trends. This new tool will enhance understanding of the role of forests in carbon sequestration and the impact of climate change on such disturbances. "One quarter of CO2 emissions are going to terrestrial ecosystems, but the details of those processes and how they will respond to a changing climate are inadequately understood, particularly for tropical forests," Chambers said. "It's important we get a better understanding of the terrestrial sink because if it weakens, more of our emissions will end up in the atmosphere, increasing the rate of climate warming. To develop a better estimate of the contribution of forests, we need to have a better understanding of forest tree mortality." Chambers, in close collaboration with Robinson Negron-Juarez at Tulane University, Brazil's National Institute for Amazon Research (Instituto Nacional de Pesquisas da Amazônia [INPA]) and other colleagues, studied a section of the Central Amazon spanning over a thousand square miles near Manaus, Brazil. By linking data from Landsat satellite images over a 20-year period with observations on the ground, they found that 9.1 to 16.9 percent of tree mortality was missing from more conventional plot-based analyses of forests. That equates to more than half a million dead trees each year that had previously been unaccounted for in studies of this region, and which need to be included in forest carbon budgets. Their findings were published online this week in a paper titled, "The steady-state mosaic of disturbance and succession across an old-growth Central Amazon forest landscape," in the Proceedings of the National Academy of Sciences (PNAS). "If these results hold for most tropical forests, then it would indicate that because we missed some of the mortality, then the contribution of these forests to the net sink might be less than previous studies have suggested," Chambers said. "An old-growth forest has a mosaic of patches all doing different things. So if you want to understand the average behavior of that system you need to sample at a much larger spatial scale over larger time intervals than was previously appreciated. You don't see this mosaic if you walk through the forest or study only one patch. You really need to look at the forest at the landscape scale." Trees and other living organisms are key players in the global carbon cycle, a complex biogeochemical process in which carbon is exchanged among the atmosphere, the ocean, the biosphere and Earth's crust. Fewer trees mean not only a weakening of the forest's ability to absorb carbon, but the decay of dead trees will also release carbon dioxide back into the atmosphere. Large-scale tree mortality in tropical ecosystems could thus act as a positive feedback mechanism, accelerating the global warming effect. The Amazon forest is hit periodically by fierce thunderstorms that may bring violent winds with concentrated bursts believed to be as high as 170 miles per hour. The storms can blow down many acres of the forest; however, Chambers and his team were able to paint a much more nuanced picture of how storms affected the forest. By looking at satellite images before and after a storm, the scientists discerned changes in the reflectivity of the forest, which they assumed was due to damage to the canopy and thus tree loss. Researchers were then sent into the field at some of the blowdown areas to count the number of trees felled by the storm. Looking at the satellite images pixel by pixel (with each pixel representing 900 square meters, or about one-tenth of a football field) and matching them with on-the-ground observations, they were able to draw a detailed mortality map for the entire landscape, which had never been done before. Essentially they found that tree mortality is clustered in both time and space. "It's not blowdown or no blowdown—it's a gradient, with everything in between," he said. "Some areas have 80 percent of trees down, some have 15 percent." In one particularly violent storm in 2005, a squall line more than 1,000 miles long and 150 miles wide crossed the entire Amazon basin. The researchers estimated that hundreds of millions trees were potentially destroyed, equivalent to a significant fraction of the estimated mean annual carbon accumulation for the Amazon forest. This finding was published in 2010 in Geophysical Research Letters. Intense 100-year droughts also caused widespread tree mortality in the Amazon basin in 2005 and 2010. As climatic warming is expected to bring more intense droughts and stronger storms, understanding their effect on tropical and forest ecosystems becomes ever more important. "We need to establish a baseline so we can say how these forests functioned before we changed the climate," Chambers said. This new tool can be used to assess tree mortality in other types of forests as well. Chambers and colleagues reported in the journal Science in 2007 that Hurricane Katrina killed or severely damaged about 320 million trees. The carbon in those trees, which would eventually be released into the atmosphere as CO2 as the trees decompose, was about equal to the net amount of carbon absorbed by all U.S. forests in a year. Disturbances such as Superstorm Sandy and Hurricane Katrina cause large impacts to the terrestrial carbon cycle, forest tree mortality and CO2 emissions from decomposition, in addition to significant economic impacts. However, these processes are currently not well represented in global climate models. "A better understanding of tree mortality provides a path forward towards improving coupled earth system models," Chambers said. Besides understanding how forests affect carbon cycling, the new technique could also play a vital role in understanding how climate change will affect forests. Although the atmospheric CO2 concentration has been rising for decades, we are now only just starting to feel the effects of a warming climate, such as melting glaciers, stronger heat waves and more violent storms. "But these climate change signals will start popping out of the noise faster and faster as the years go on," Chambers said. "So, what's going to happen to old-growth tropical forests? On one hand they are being fertilized by some unknown extent by the rising CO2 concentration, and on the other hand a warming climate will likely accelerate tree mortality. So which of these processes will win out in the long-term: growth or death? Our study provides the tools to continue to make these critical observations and answer this question as climate change processes fully kicks in over the coming years."